Save you money – up to 40% versus traditional survey methods. Save you time – typical UAS aerial data collections can take less than an hour for a 100-acre site. Increase your accuracy – precision aerial mapping produces millions of points vs. a few thousand when compared to traditional ground surveys. Precision Aerial Mapping using UAS, represents a technology with the potential to forever change the way you perform surveying and engineering services. UAS surveys provide a more complete representation of the earth’s surface using hundreds of millions of points, as opposed to a few thousand when compared to traditional ground surveys. 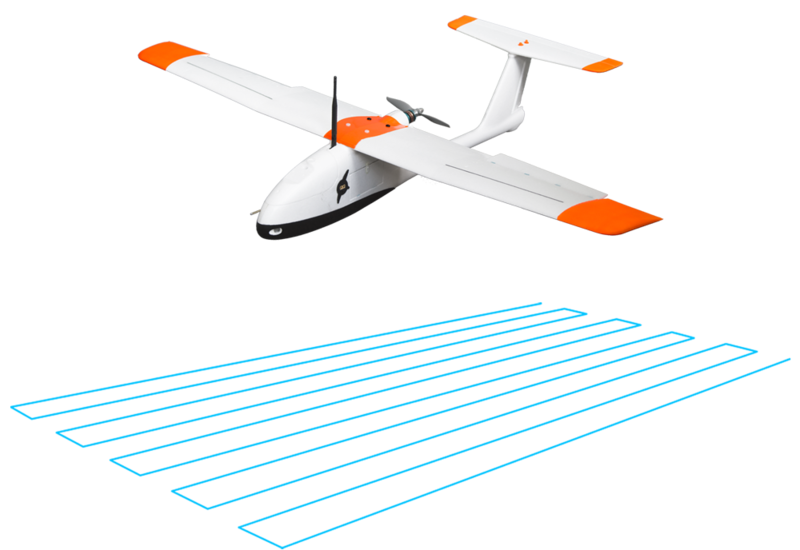 With each point representing 1 square inch on the ground, your UAS is essentially a surveyor in the sky. Precision aerial surveying and mapping relies on accurately capturing thousands of images taken from the UAS and then stitching them together to make one cohesive three-dimensional visual representation (orthomosaic) of the area of interest. Maintaining a regular overlap pattern is very important for accurate processing particularly in regard to resolving the shape of the terrain and contained structures. Irregular patterns can result in gaps in the 3D data sets which can significantly impact the absolute accuracy of the data set. In a comparison study conducted by CH2MHill of leading photogrammetry systems, Black Swift’s SwiftCore Flight Management System (FMS) was proven to be the most accurate and precise FMS on the market today. You can view the results of their comparison here. A UAS solution from Black Swift Technologies is a fully-integrated solution consisting of the aircraft (airframe) and mission planning software specifically engineered from inception to work in concert for the most efficient, reliable, and accurate aerial mapping platform available. For precision aerial mapping and detailed photogrammetry missions you will likely find that this is the only system that you need. For more complex missions our team has unmatched expertise in system design and integration. We can help you select and integrate an efficient system combining the right airframe and sensor suite with our flight management system. Professional Surveyors and Engineers carry the durable BlackSwift S1™ UAS with them to the job site and can hand launch the drone for their surveying and aerial mapping jobs. The BlackSwift S1 can be programmed in minutes to calculate the area under review and then begin collecting the data for immediate analysis and decision making. Using your choice of survey or engineering processing software, you can develop outstanding 2D orthomosaic and 3D point cloud maps with accuracy traditional methodology cannot match. While the process of gathering aerial data is easy, generating useful precision aerial mapping deliverables involves expertise in multiple disciplines including: aviation, surveying, photography, photogrammetry, ASPRS accuracy standards, geodesy, and finally engineering. For those who don’t want to invest the time and money necessary to understand the intricacies regulating commercial drone applications and FAA Part 107, Black Swift Technologies has partnered with UAS service providers that have the qualifications and expertise to deliver survey-grade accuracy to civil engineering and survey professionals using precision aerial mapping. Contact us to learn more. Our customers rely on our UAS solutions for the accuracy and efficiency they have come to expect from BST. Read about these real-life solutions and discover how BST can help take your business to new heights. Take your scientific research to the next level with Black Swift Technologies.